With spring peeking through the clouds, there's only one thing on our mind here at Indian Trails: travel plans! We're sharing our bucket list for spring of 2018, from can't-miss traditions to new experiences, here's where we'll be this spring. March: It was a long winter but you know it’s over when the Cornwell Dinner Theatre reopens at Cornwell’s Turkeyville, just north of Marshall. Once you’ve been to Turkeyville, it will always be on your list of favorites for food, fun and great live theater. 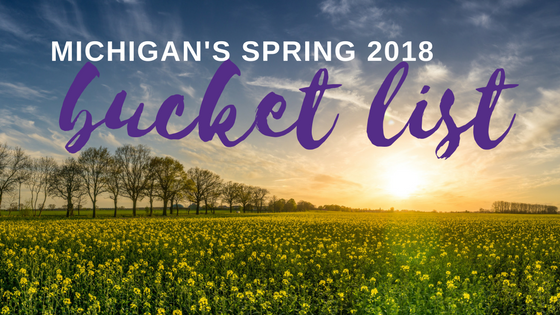 Check out the 2018 lineup and book a bus today with family and friends for the perfect celebration of spring in Michigan! March: Hey batter!!!! It’s almost here … March 29, Opening Day of Tiger baseball and time to party from one end of town to the other. If you haven’t experienced this incredible day, you won’t be disappointed. It’s one tailgate after another from the parking lot to the Eastern Market. First pitch is at 1:10 p.m. so plan to get there early and enjoy the passion that is Tiger baseball in Detroit City! Get tips for attending from visitdetroit.com. March and April: Butterflies before June? Jump into spring at the annual Fred & Dorothy Fichter “Butterflies Are Blooming” exhibition at Meijer Gardens, in Grand Rapids. The largest temporary tropical butterfly exhibition in the nation lets you walk through the Tropical Observatory as 7,000 butterflies of 50 different species flutter about you in free flight. And of course, no matter the weather outside, it’ll be a balmy 85 degrees inside. It’s an extraordinary gift to summer starved Michiganders! April: Magic is so mysterious and, well, magical! If you’ve ever wondered how it works, check out 31 Flavors of Magic, on April 14th in downtown Colon, home of famous magicians Harry Blackstone and Harry Blackstone Jr., and Michigan’s most magical town. Gather a big group of friends for this amazing day featuring “every possible variant of magic imaginable” and enjoy family fun at every storefront in town on the Midway of Magic. April: The Moth Radio Hour … you listen to it on NPR and always wish just once you could attend in person. Well now you can because The Moth Mainstage returns to The Traverse City Opera House on April 20! “The Moth Mainstage celebrates the ability of stories to honor both the diversity and commonality of human experience, and to satisfy a vital human need for connection.” Don’t miss this opportunity to enjoy The Moth live! April: No bucket list could be complete without a live Beatles concert, right? Well how about the next (and only) best option, 1964 THE TRIBUTE, April 21 at the Mendel Center at Lake Michigan College in Benton Harbor. This incredibly authentic and extremely well researched performance will come as close to the real thing as we can ever hope to get today. In fact, it’s so good it has earned the distinction from “Rolling Stone” as the “Best Beatles Tribute on Earth.” Don’t miss it! May: You know it’s really spring when the Island House Hotel on Mackinaw Island opens for the season with its Kentucky Derby Party! Get in on the great packages available and your group will revel in the day-long festivities including Mint Juleps with prizes for best dressed, biggest hat and favorite fascinator. What better place to watch the 144th running of the Kentucky Derby than on an island where all transportation is by horse? May: Moms, this one’s for you! Really take Mother’s Day off and book a trip to the Women’s Wine & Chocolate Walk in beautiful downtown Manistee on the shores of Lake Michigan. Shop, shop, shop and along the way enjoy 11 tasting locations: six locations offering different wines and five locations offering different chocolates. Participants receive a tasting glass with wine charm and prizes will be awarded too! May: The 55th East Lansing Art Festival, May 19-20, is a not-to-be-missed event that includes art from some of the nations’ best, as well as two days of diverse live music venues, really wonderful food choices, and even an area with special activities just for kids. This event offers both browsing and buying opportunities, is extremely family friendly and never fails to entertain! These are just a handful of options to add to your spring travel bucket list and now is the time to get your planning in order. Can't get enough? Check out our group trip ideas for more inspiration. If you need a little help, check out Indian Trail’s “Complete Guide to Booking a Bus” to make planning and booking your next charter a breeze!